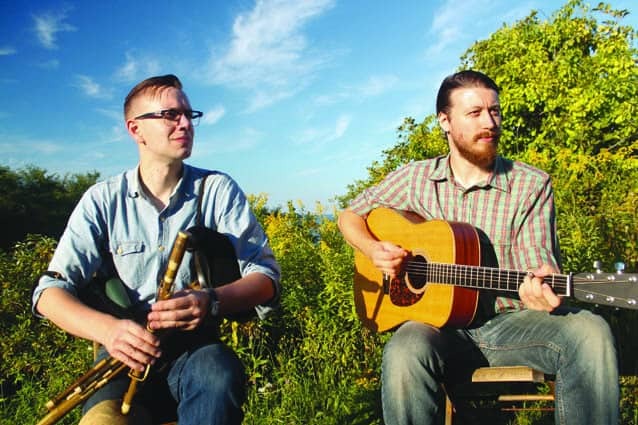 Saturday, Sept. 10 at 7:30 p.m.—BRANDON—Brandon Music welcomes Will Woodson and Eric McDonald, two of today’s finest young proponents of traditional Scottish music, on Sept. 10 at 7:30 p.m. With an unusual blend of wind and plucked strings, they bring a welcome sensitivity to a tradition that is often known for its high velocity. Still, their music is full of drive and energy, thanks to shared impulses that permeate their simpatico sound. It’s the sum product of two musicians well versed in their tradition, playing honest and at times risky music. Together, Woodson and McDonald weave their sounds into a textured and detailed fabric, fusing border pipes, wooden flute, guitar, mandolin, and voice to create a sound that is sweet but also wild, traveling from darkness to light. This event is a part of Vermont Arts 2016, celebrating public funding for the arts. Concert tickets are $20. Reservations are recommended. Venue is BYOB. Call 802-247-4295 or e-mail info@brandon-music.net for reservations or for more information. Brandon Music is located at 62 Country Club Road, Brandon.